The National Congress of American Indians (NCAI) is a Native American and Alaska Native indigenous rights organization. It was founded in 1944 to represent the tribes and resist federal government pressure for termination of tribal rights and assimilation of their people. These were in contradiction of their treaty rights and status as sovereign entities. The organization continues to be an association of federally recognized and state-recognized Native American tribes. Historically the Indian peoples of the North American continent rarely joined forces across tribal lines, which were divisions related to distinct language and cultural groups. One reason was that most tribes were highly decentralized, with their people seldom united around issues. In the 20th century, a generation of Native Americans came of age who were educated in multi-tribal boarding schools. They began to think with a broad pan-Native American vision. and they learned to form alliances across tribes. They increasingly felt the need to work together politically in order to exert their power in dealing with the United States federal government. In addition, with the efforts after 1934 to reorganize tribal governments, activists believed that Indians had to work together to strengthen their political position. Activists formed the National Congress of American Indians to find ways to organize the tribes to deal in a more unified way with the US government. They wanted to challenge the government on its failure to implement treaties, to work against the tribal termination policy, and to improve public opinion of and appreciation for Indian cultures. The initial organization of the NCAI was done largely by Native American men who worked for the Bureau of Indian Affairs, and represented many tribes. Among this group was D'Arcy McNickle of the BIA. At the second national convention, Indian women attended as representatives in numbers equal to the men. The convention decided that BIA employees should be excluded from serving as general officers or members of the executive committee. The first president of the NCAI was Napoleon B. Johnson, a judge in Oklahoma. Dan Madrano (Caddo) was the first secretary-treasurer; he also had been serving as an elected member of the Oklahoma State Legislature. From 1945 to 1952, the executive secretary of the NCAI was Ruth Muskrat Bronson (Cherokee), who established the organization's legislative news service. Bronson's work was largely voluntary, as the organization could not afford to pay her to act as its executive secretary. In 1950 John Rainer became the first paid executive director of NCAI. He was replaced by Bronson in 1951, who resigned in 1952. Frank George, a Nez Perce from the Colville Indian Reservation, briefly held the post before Helen Peterson (Cheyenne-Lakota) took over the post as the executive director of the organization in 1953. That same year, W. W. Short replaced Johnson as president of NCAI. In 1954, Short was replaced by Joseph Garry (Coeur d'Alene), a veteran of both World War II and the Korean War. Garry significantly enlarged the organizational direction away from its focus on issues of Native Americans in the Great Plains and the Southwest, making it more inclusive of tribes in the Midwest and Northwest. In 1966, the NCAI mustered nearly 80 tribal leaders from 62 tribes to protest their exclusion from a US-Congress sponsored conference on reorganizing the BIA (Bureau of Indian Affairs). The Congressional event was organized by Morris Udall, chairman of the House Committee on Interior and Insular Affairs, to discuss the reorganization of the Bureau of Indian Affairs. Udall eventually allowed the NCAI representatives to attend. He confirmed that a group composed of tribe members, called the Tribal Advisory Commission, would be created to advise him. During the late 20th century, NCAI contributed to gaining legislation to protect and preserve Indian culture, including NAGPRA. They worked with the tribes to assert their sovereignty in dealing with the federal government. In 2017, the NCAI took over the assets of the Indian Country Media Network, which were donated by the Oneida Nation of New York. It had owned and operated the network for some time. The NCAI continues to operate the news service, primarily online. It reports on Native American news and has especially covered politics in depth. A substantial number of its members reside upon the same reservation or (in the absence of a reservation) in the same general locality. It is recognized as a Tribe or other identifiable group of Native Americans by the Department of the Interior, Court of Claims, the Indian Claims Commission, or a State. An Indian or Alaska Native organization incorporated/chartered under state law is not eligible for tribal membership. Treasurer: W. Ron Allen of the Jamestown S'Klallam Tribe of Washington. In addition to these four positions, the NCAI executive board also consists of twelve area Vice-Presidents and twelve Alternative Area Vice-President. The executive director of National Congress of American Indians is Jackie (Jacqueline) Pata. She has served as executive director since 2001. Jackie Pata serves on the Sealaska Board of directors and the Tlingit and Haida Central Council Executive Committee. Every tribe gets a number of votes allocated them specific to the size of each tribe. Members were hot discussion topics and often made headlines in valued newspapers such as The New York Times. The successes of the NCAI over these years have been a policy of non-protesting. As a matter of fact, the NCAI were known in the 1960s to carry a banner with the slogan, "INDIANS DON'T DEMONSTRATE." In 1950, the NCAI influenced the insertion of an anti-reservation clause to the Alaska Statehood Act. This clause removes the ban against reservations for Alaskan Natives. On July 8, 1954, NCAI won their fight against legislation that would have allowed the states to take civil and criminal jurisdictions over Indians. In 2015 the organization successfully lobbied the State of California to ban the term "redskins" which is the name of a pro football team in Washington, from being used by public schools in the state of California. In the early 1960s, a shift in attitude occurred. Many young American Indians branded the older generation as sell-outs and called for harsh militancy. Two important militant groups were born: the American Indian Movement (AIM) and the National Indian Youth Council (NIYC). The two groups protested several conventions. The advertising firm of DeVito/Verdi created a poster for the NCAI to highlight stereotypical Native American mascots. Protection of the Rights of all Indian people to decent, safe and affordable housing." 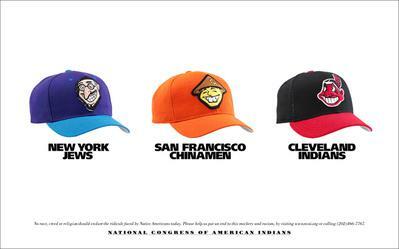 In 2001, the advertising firm of DeVito/Verdi created an advertising campaign and poster for the NCAI to highlight offensive and racist sports team images and mascots. In October 2013, the NCAI published a report on sports teams using harmful and racial "Indian" mascots. Ira Hayes: American hero during the battle of Iwo Jima, and also made a speech in the congress. Nipo T. Strongheart performer-lecture and technical advisor on several Hollywood films involving Native Americans and a cofounder. ^ Cowger, Thomas W. The National Congress of American Indians: The Founding Years. Lincoln, NE: University of Nebraska Press, 1999. ^ Harvey, Gretchen G. (2004). "Bronson, Ruth Muskrat". In Ware, Susan; Braukman, Stacy (eds.). Notable American Women: A Biographical Dictionary Completing the Twentieth Century. 5. Cambridge, Massachusetts: Harvard University Press. pp. 80–82. ISBN 978-0-674-01488-6. ^ a b Cowger 1999, p. 74. ^ Cowger 1999, p. 53. ^ Cowger 1999, p. 69. ^ Cowger 1999, pp. 110-111. ^ Cowger 1999, pp. 111-112. ^ Champagne, Duane (2001). The Native North American Almanac. Farmington Hills, MI: Gale Group. ISBN 978-0787616557. ^ "Oneida Nation to Donate Indian Country Today Media Network Assets to NCAI". Indian Country Media Network. October 4, 2017. Retrieved January 20, 2018. ^ "California Becomes First State to Ban 'Redskins' Nickname". ^ Roller, Emma (October 10, 2013). "Old Poster Goes Viral, Teaches Multiple Lessons". Slate. Retrieved August 31, 2016. ^ "Ending the Era of Harmful "Indian" Mascots" (PDF). October 1, 2013. Retrieved August 29, 2016. ^ Fisher, Andrew H. (Winter 2013). "Speaking for the First Americans: Nipo Strongheart and the campaign for American Indian citizenship". Oregon Historical Quarterly. 114 (4): 441–452. doi:10.5403/oregonhistq.114.4.0441. ISSN 0030-4727. Retrieved August 22, 2014. National Congress of American Indians: Constitution, By-Laws and Standing Rules of Order. Found on the official NCAI website, this article was last amended in 2007. It states the purpose of the NCAI, the different types of memberships, and the rules and regulations. Cowger, Thomas W. (1999). The National Congress of American Indians : the founding years. Lincoln, Nebraska: University of Nebraska Press. ISBN 978-0-8032-1502-3. Deloria, Vine Jr. Custer Died for Your Sins: An Indian Manifesto. New York: Avon Books, 1970. This book explores the reality and myths surrounding Indians, the problems of leadership, and modern Indian affairs. Johnson, N B. The National Congress of American Indians. Written by the Justice of Supreme Court of Oklahoma and published in the Chronicles of Oklahoma, this article discusses the formation of the NCAI, and Congress'reaction. Report of Activities, American Association on Indian Affairs, June 1945-May 1946. This article discusses the reasons why a nationwide organization of Indians is so crucial. Cowger, Thomas W. The National Congress of American Indians: The Founding Years. Lincoln, NE: University of Nebraska Press, 1999. This page was last edited on 9 April 2019, at 06:00 (UTC).